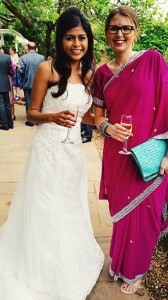 This week I had the massive honour of making a wedding cake for some great friends – Steve and Asmita. 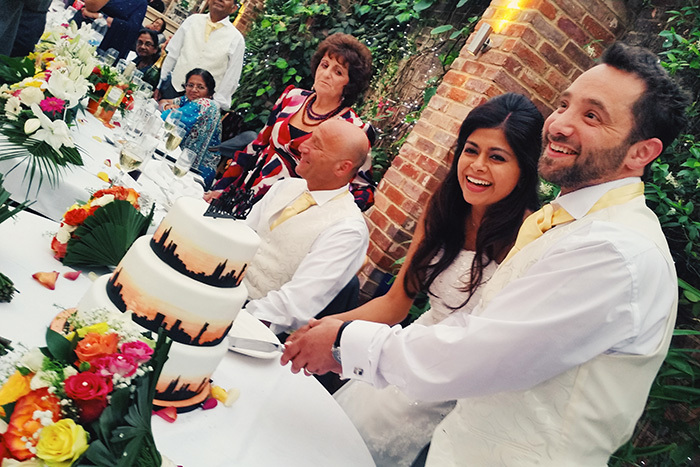 Steve and Asmita were having an epic wedding day with 3 different ceremonies packed in – starting with a Hindu ceremony, followed by a civil ceremony and finishing with a Jewish ceremony. I believe in total they got married 6 times in just one day! 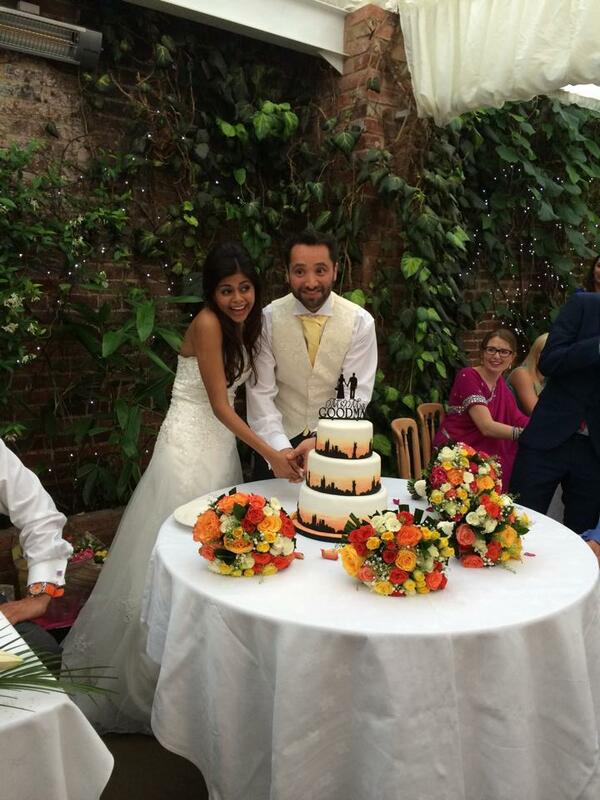 It was an amazing day filled with love, laughter and of course….cake! 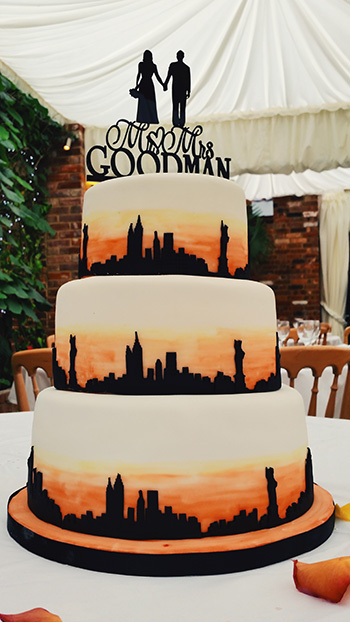 Steve proposed to Asmita in New York so they requested a New York themed wedding cake. At first I found this concept really difficult to turn into a sophisticated wedding design but after a bit of research and talking to them we decided to go for a really simple design. 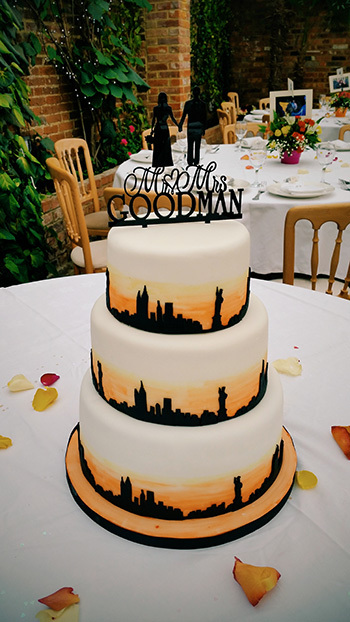 And I think it turned out really well considering this is only my second ever wedding cake and it had to travel 80 miles to the wedding venue (I did have to educate my husband how to drive with a wedding cake in the car!!) . After letting go and leaving the cake to be put together by the caterers while I was enjoying the ceremonies I was eager to take a look at the finished product. But at the same time, I was too scared to go and have a look! So my husband went and took a few photos for me. I was amazed at the overall look – this was the first time I had seen it all stacked together. 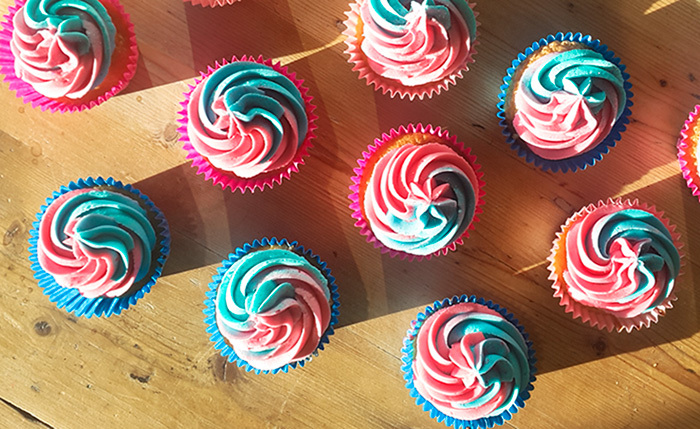 I had brought what I called my “Cake SOS” box full of edible glue, icing, ready made colour washes in all three hues, cutters…everything I could possibly need, but thankfully I didn’t need any of it. Everyone loved it especially the Bride and Groom so I couldn’t be happier. If anyone has any tips on making a wedding cake please feel free to share them in the comments! The cake is so perfect! Best wishes for the both of you..